MELISA is performed under license by laboratories worldwide. The technology is protected by trademark to ensure that all the tests are performed with the same technique and high quality. Even though it is possible to send blood to an existing laboratory from most parts of the world, we are looking for new partners who can spread the knowledge about metal allergy and make the test more accessible to patients. At the moment, MELISA is mainly used for the diagnosis of metal allergy, but the test is also developed for drugs, chemicals and infectious agents. Some laboratories routinely test for allergy to gluten, candida and moulds. MELISA is also used to diagnose active Lyme Borreliosis, which appears to be a more accurate test for diagnosing active Lyme disease than standard tests (Western Blot, PCR). For more information see our Lyme disease page. We license the know-how of the MELISA technology. MELISA is an optimized lymphocyte transformation test, and therefore uses radioactivity. A potential MELISA laboratory must have permission to use radioactivity. We work together with laboratories and do not sell any kits. We are very interested in developing the test for other substances such as bacteria, pesticides and food allergens. This can be done in connection with standard commercial testing. Below is a short description of how MELISA works. More details can be found in our published articles, most notably in MELISA – an in vitro tool for the diagnosis of metal allergy. Blood in citrate tubes should arrive at the laboratory ideally within 24 hours after the blood has been drawn, and maximally within 48 hours. Lymphocytes are isolated and tested against allergens chosen according to the patient’s anamnesis, dental and occupational history. 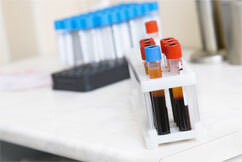 The blood is incubated for five days and the lymphocyte reaction is measured by two separate technologies: one based on the uptake of radioisotope by dividing lymphocytes; the other an evaluation by microscopy. The level of reactivity is measured as a Stimulation Index (SI). A value over 3 indicates a positive reaction to a given allergen. A report with all values is given to the referring physician.